One dispute doesn’t end that other starts, every moment there is such unrest going on, which forces nation to worry about the integrity of country. At least there is some force behind this which wants to keep nation in chaos? Sometimes the linguistic riots erupts, the process to cool down this is going on that religious and sectarian disputes are highlighted, if no reason for unrest is found the provincial disputes are promoted to create chaos. While no one is ready to give attention towards the actual problems of the public, used by all parties and their leaders to win elections, but after getting in power they blame ex-govt. for all these problems and this process keeps on going. The most painful aspect of this game is that when these politicians could not give a satisfactory reply to the problems they all end up on this, “the integrity of Pakistan is endangered, Pakistan is going to be disintegrated because it is useless now for USA”. Pakistan is the sole country in the world whose citizens' favorite topic is safety of their mother land, is this discussion done by general public? No! this duty is fulfilled by our rich elites, so called enlightened and modern liberal fascists in lobbies of five star hotels, or in the gatherings of so called intellectuals. In the free time their favorite topic of discussion is, “When Pakistan is going to be broke” (and they going to be entitled for payment). In Libya the treachery against Gaddafi formed the shape of civil war and for six months whole country was in the grip of civil war. There are also people from different cultures, languages and tribes, but no one ever dared to talk about the disintegration or change in the boundaries of the country. Whether these are Congo, Rwanda or troubled countries of Latin America, in spite of the grave internal situation no one has ever dared to talk about the disintegration of these countries, than why only we are indulged in this problem. At least why we have less trust over the integrity of our motherland, and more over the rented external think tanks and their negative reports? However, have we ever thought, American intellectuals, unaware of our seasons as well, why don’t they represent their hypothesis or imaginary maps about other countries of the world like they do in case of Pakistan. Why only they make forecasts about Pakistan that it will break in 2012, than they extend their forecast to 2015 and now according to new prediction till 2025 Pakistan will not be present on the map of the world. Cannot we understand such a little fact that in the whole world there is only country India who has made the separate identity of Pakistan the problem for its integrity? It is the only country which thinks Pakistan as an integral part of India, which was cut down by Muslims of India under the leadership of Quaid-e-Azam Muhammad Ali Jinnah based on Two Nations Theory. India; whose all foreign policies hover around only one point that Pakistan should be weakened internally to such extent state that it loses its identity, and in order to fulfill its damn dreams, Two Nations Theory is the first target of India, because this ideology was the cause of division of India. This is the miracle of Indian investment that Pakistan is unable to build Kala Bagh Dam, and this is the miracle of Indian investment as well that American (rented) think tanks are issuing negative reports against Pakistan on daily basis. But the shameful aspect is that such propaganda is warmly welcomed in Pakistan, on the one hand anti-Two Nation Theory elements take it as a success of their heinous thinking and try to spread further pessimism, while on the other hand the opposition uses these reports to pressurize ruling party. Otherwise had any think tank of USA presented any map before disintegration of Soviet Union or in the case of fall of Dhaka there was no such map or report visible. In contrast to this USA was angry with Pakistan because during China-India war in 1962 Pakistan has not allowed India to use Eastern-Pakistan air bases against China and USA wanted to make Eastern Pakistan an independent state before any expected India-China war. Behind the fall of Dhaka, there were also Hindu conspiracies and dream of Akhand Bharat. In this conspiracy, India had full support of higher officials and prominent personalities of Pakistan. If American think tanks are so much capable of predicting future than why did not they warn USA about attack over Afghanistan that do not go there this will prove graveyard for American forces. In spite of ten years Americans have failed to bring peace there or give a suitable reason for attack over a sovereign country. Than why there is pessimism just because of the so-called maps prepared by few lunatics of American think tanks, why are we worried that USA wants to disintegrate Pakistan. If we are ourselves ready to burn our own house than why blame others, on the one hand we take oaths to protect our motherland and on the other hand we discuss the possibilities of disintegration of Pakistan, at least why? We should be ashamed of this and we should be accountable to our subconscious, are not our enemies using us against our own country? The maps shown by Altaf Hussein during Press Conference which were prepared by Ralph Peter, who got self retirement from US military, he published those maps in his article BLOOD BORDERS in 2006 in American Armed Forces Journal. While above mentioned article had been already published in January 2006 without maps. In his article he has tried to convince international community that in order to establish peace in the world the present boundaries of the Middle East should be changed because Muslims have been divided into Ismaeli, Naqashbandi, Shia and Kurds etc. So that is why whole world is in the clutches of terrorism, especially Wahabi sect is misusing this situation and is busy in cultivating extremism and terrorists. For this purpose Saudi Arab and Pakistan are playing important role. The change of boundaries on the basis of Blood relations, sects and tribes is inevitable. This was the reason behind the name of the article BLOOD BORDERS. The strange thing in this map is that the link of Pakistan with China in this map has been cut-down, which is the old dream of India, keep in mind that along with the publishing of these maps editor of the magazine had included the stance of American govt. as well in order to fulfill legal demands. Commenting on this White House termed these maps as innovation of writers brain and termed this as impractical because the geography of a country is not the cake of Ralph Peter’s birthday which can be simply cut down according to his wishes and divided among peoples. Moreover Armed Forces Journal has nothing to do with American forces or govt. and neither it has any readers outside USA. Now a days a map about American conspiracy has been cause of trouble for Pakistani public. People are worried that what will be their fate? Above mentioned map was presented by Altaf Hussein as a proof while talking about a USA conspiracy against Pakistan. If this had been done by a common man this was not something to be worried about because due to favors of India we can see hundreds of such maps on the net. While Altaf Hussein has also said that after unveiling the USA conspiracy and maps he may not address the public, live again. However, he did not disclose that when and where these maps were prepared? Lets first talk about the above mentioned map, these maps were published by American digest, “Armed Forces Journal” in its June 2006 edition. If one may remember Dr. Shahid Masood had done 2 or 3 programs on these maps as host in a talk show and in order to pressurize Musharaf govt. our famous politicians have given their comments over these maps that this is because of the dictatorship that USA is going to break Pakistan into pieces. Like Altaf Hussein, Mr. Shahid had not informed nation that who had prepared these maps and what was the purpose behind them and are they really part of any conspiracy to disintegrate Pakistan? 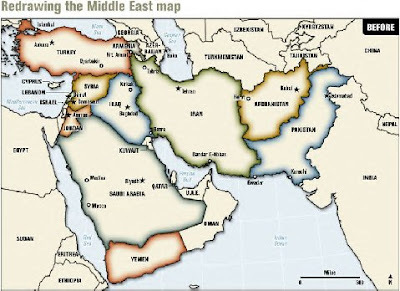 Astonishing fact is that even now, our intellectuals and politicians predicting the future of the Pakistan on the basis of these maps have not dared to look over the pruning of other Middle Eastern countries in these maps. In these maps, in very funny manners the boundaries of Turkey, Iraq, Saudi Arabia, Iran, Afghanistan and Pakistan have been changed and divided into a dozen of states, in this map neither Palestine is visible (for which UNO is preparing to accept it as a sovereign country) nor the Chinese province Xinjiang has been cut away from China (for which USA and India had joint ventured for creating unrest), nor the freedom fighters within India had been given any importance where 16 recognized freedom movements are present. Even India itself accepts that about 1/3rd of India is under the control of freedom fighters. 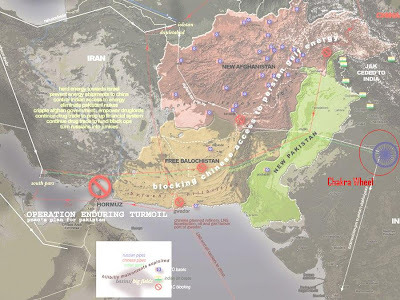 The great joke in the map is including Indian Held Kashmir into India while showing Azad Kashmir as part of Afghanistan. All these factors show the immaturity, hatred against Muslims and sponsorship of India and Jews for the maker of the map. This is also visible from the title of the map i.e. Redrawing the Middle East Map. Moreover there is nothing exceptional in the map to worry about, you may buy latest “world atlas” or encyclopedia, or open any website you will find thousands of such maps. In these maps one can find the details of religions, nations, languages, tribes of sects of every continent, which had been represented leaving aside the geographical boundaries of the countries. 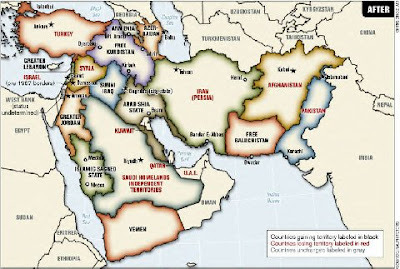 Here one may raise the question if these maps do not have any importance that what is the problem, the problem is not of these maps but traitors present within us in the name of liberalism, who think division of India and establishment of Pakistan was unnecessary, and position of Pakistan against India is source of pain for them. In spite of expressing their views against Pakistan openly, they take the support of Hindu and Jewish propaganda and try to create unrest and pessimism in Pakistani public. Sometimes they have the dreams of Greater Pakhtunistan and sometimes they foresee Greater Baluchistan. They cry for the shortage of electricity but when one talks about the building to Kala Bagh Dam they threaten that Pakistan will broke apart, so no construction of dams, if one talks about the independence of Kashmir from India, they get angry because according to them Pakistan is a failed state (while India murderer of uncountable humans is favorite state, so why do not they migrate to India to enjoy liberalism and democracy?). But they should keep in mind that Pakistan was established forever and will be there forever (they may live or die not a problem).